Sorry so many garlic questions but this year is my first real go at it. It looks to be a good year as well and I don't want to mess up. Following are some pics as of today of my garlic (Music and Chesnok Red). It is the middle of June we are and have been having weird weather. Some of you know my scapes have been coming up for a while and most have been cut off. I am leaving one just cause. So looking at the pics what do you think? Should I give it till July, mid July maybe August. It has been yellowing up a lot this past week. I did peek and found a pretty good sized bulb. I also picked one the other day that was a goner a very small bulb but it did have the divisions you look for, it wasn't a single ball but had separate cloves in it though very small. Garlic lovers come to my call please. It's getting so close and I am getting so very excited!!!!!!!! 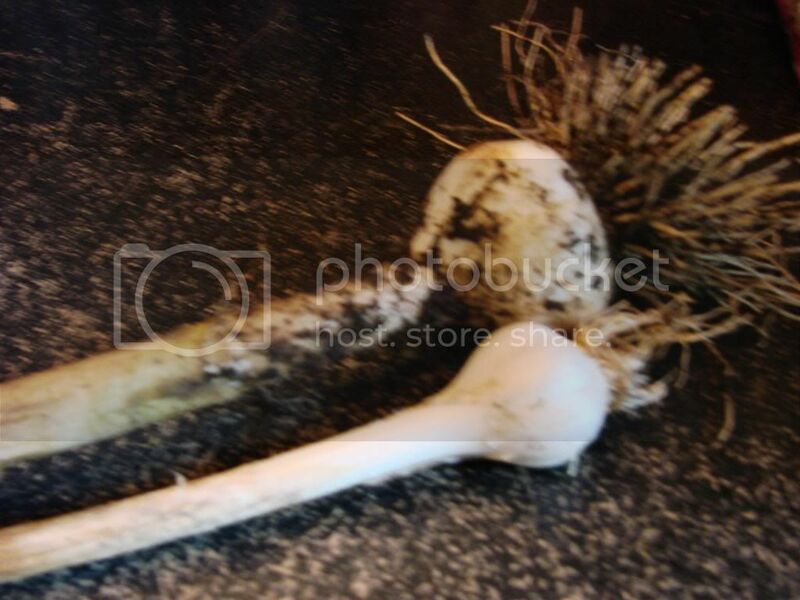 I will be planting garlic for the first time this fall. Yours looks great! Going by looks alone, the leaves look about right. How about showing us one of the bulbs? Mine are maybe a month out. DDF Give me a day or so we just had about 5 inches of rain. 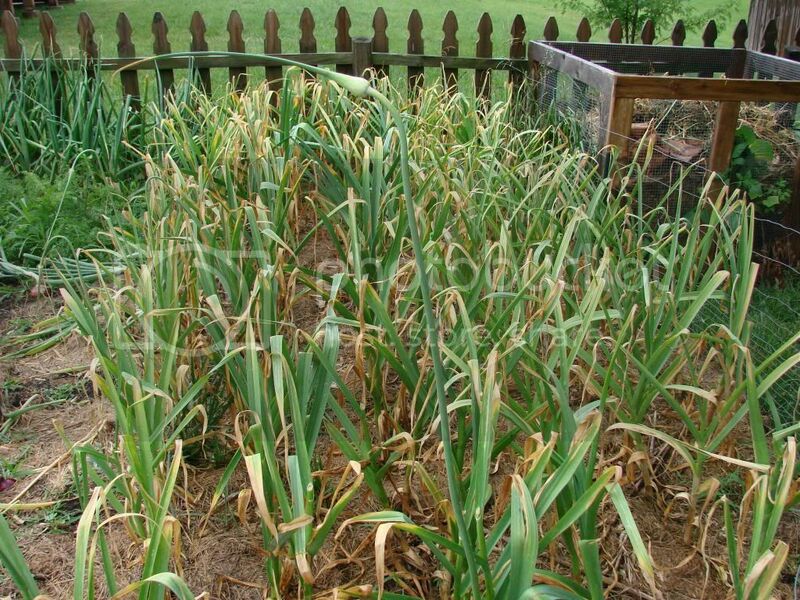 Judging by your onion bed photos and now the garlic, I'd say your garden is doing fantastic this year. So looking back on the pale/yellowish leaf conditions that had you so worried last year about now (I think). Would you say that last years trouble was too much unfinished/uncomposted manure? Apple yes that could have and may still be the problem this year though not as bad. I have container tomatoes that are kicking the butts of in ground tomatoes. No more compost this year, well maybe a little but my main amendments will be topsoil. My neighbor got some locally and it is the bomb, he say's he thinks it is half compost half topsoil. Whatever, it is the same stuff the original owner of this house got by the truckload and everywhere he put it things are crazy. Like my Willow tress are going nuts and my front flower bed I have done nothing to that seems to grow whatever you throw at it (literally) and well I might add. Soil I have not been watering but mother nature doesn't seem to be with me on this! It is supposed to dry up and get mid 90's hot tomorrow for a few day's. I am going to start curing some red onions and while I'm doing that I will pull a few garlic here and there and take some pics. See you than. 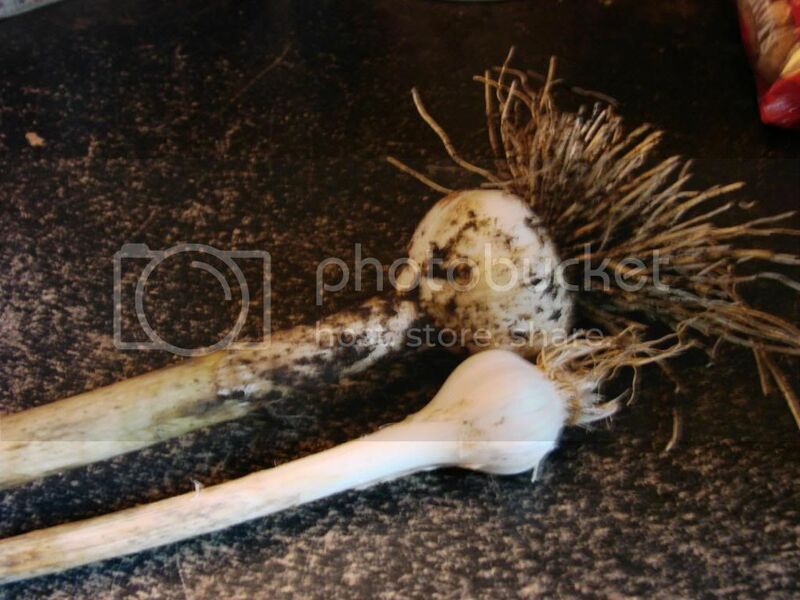 here is a pic of a random garlic and the runt of the litter I pulled a few day's ago. They look good! Don't forget to save some of the larger bulbs for this falls planting. I will be saving. I only pulled those two I am still going to leave them in for a little longer. DoubleDogFarm wrote: Going by looks alone, the leaves look about right. I just harvested some garlic & red onions. How long do I have to let them dry? I washed them off pretty good but unsure if I should just lay them outside in the sun, hang them up outside or bring them in to dry. This is my first time with garlic and red onions so I'm not sure. Washing off garlic is a bad idea. It can cause mildew to form. I wouldn't wash off onions either. 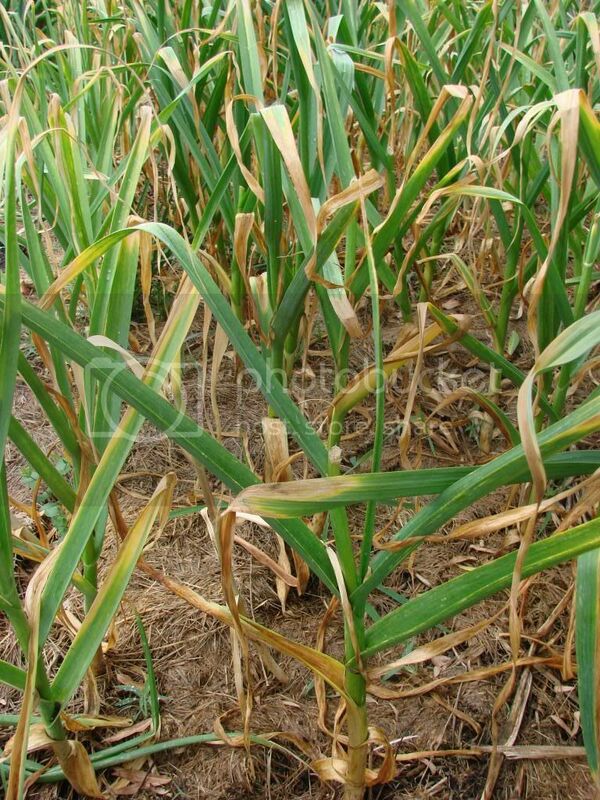 Leave the onions out side with good ventilation for 2-3 day's, no rain. 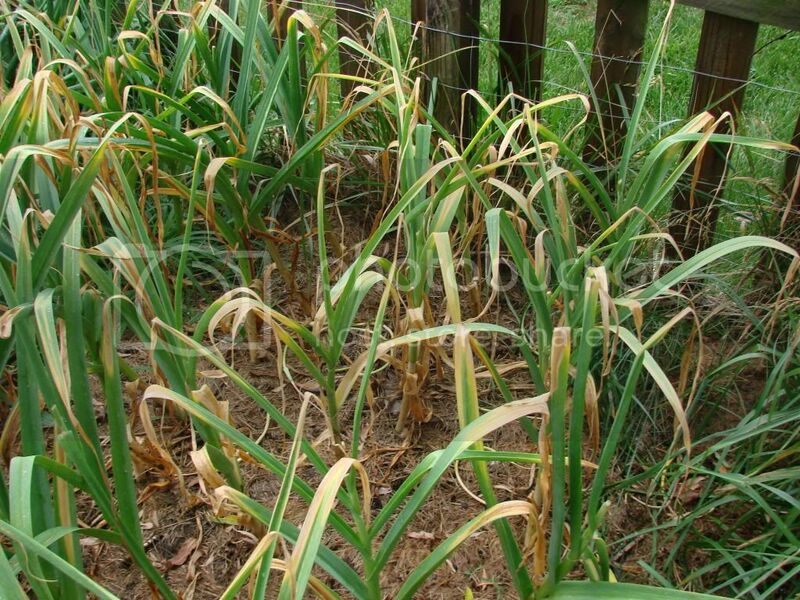 Same with garlic though garlic can get a sunburn so keep them in the shade. When they are dry brush off the dirt cut the roots and tops. Onions still need a few weeks to cure I can't remember if garlic does or not. You do it like this to help them store better you can always eat them when ever you want though. don't cut the tops, the tops are for braiding garlic. 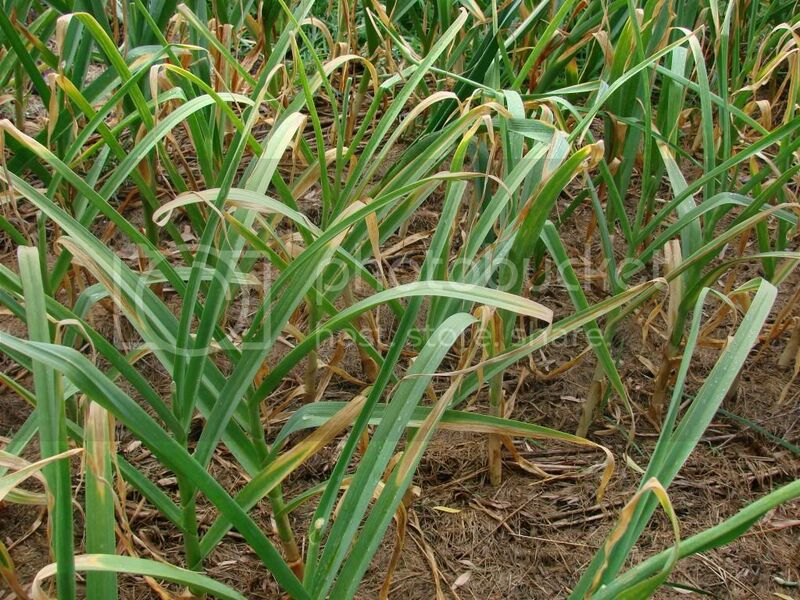 soil wrote: don't cut the tops, the tops are for braiding garlic. I've heard you should braid them but can you tell me why? Do I braid them and just let them be or what?